Did you know a secret weapon to untapped, sophisticated brushwork exists within Photoshop? YES, clone painting is possible in Photoshop! Say goodbye to hours of hand-painting lace dresses and bridal gowns, or relying entirely on a filter that may come across as auto-painted. If you want to elevate your editing toolbox, then this class at Imaging USA is for you! Michelle Parsley, M.Photog., M. Artist, Cr., CPP, will teach a day-long pre-con class that dives into the art of clone-painting. You'll begin by setting up a custom painting workspace, then you’ll load Michelle’s custom clone-painting setup action and a few of her other favorite custom brushes, and after familiarizing yourself with the mixer brush, you’ll dive right into clone painting both a simple landscape as well as a portrait, as time permits. Michelle's "Clone Painting in Photoshop" hands-on course takes place Thursday, January 17, 9:00 am - 5:00 pm, and it's a great first-step toward becoming a Photoshop Artisan! Michelle grew up drawing and painting with any medium within her reach, which got her in trouble on more than one occasion when she was little! While her artistic skills are predominantly self-taught, she is also a firm believer that education is vital to success. Michelle is a Master Artist, Master Photographer, Photographic Craftsman, and a Certified Professional Photographer. A skilled organic artist, including hand-drawn graphite and oil painting, she is uniquely equipped to create beautiful art in several mediums; her background in these traditional mediums uniquely strengthen her platform as an educator. The 2018 Double Diamond Photographer of the Year, Michelle has acquired a plethora of national awards, including the top scoring image in the Southeastern Professional Photographers Association district photographic competition. Her artistry has also received multiple first, second, and third place awards in PPA’s International Photographic Competition Grand Imaging Awards and she has been honored by Canon Corporation with the prestigious "Canon Par-Excellence Award" twice. Parsley’s artwork has been featured in books and magazines worldwide numerous times, including the prestigious Loan Collection. When she’s not at her easel, or inventing new ways to push the boundaries of the 'box" with her camera, Michelle mentors other creatives to "Elevate their Art" via online and in-person courses. What was one of the defining moments in your career? When I discovered I could take my love of traditional artistic mediums right into the digital world. Total game-changer! Who has been one of the biggest influences of your work? Laszlo, Sargent, and Boldini are three of my old masters favorites. Two contemporary favorites are Stanka Kordic and Casey Childs. What's something you are continuously captivated by? Watching an artist work. 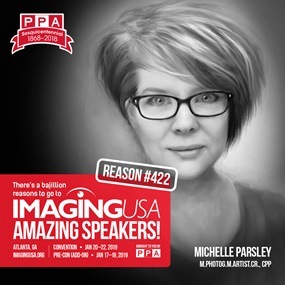 Michelle Parsley, M.Photog., M. Artist, Cr., CPP, is just one of the many amazing speakers you'll meet and learn from at Imaging USA 2019! Registration is open now at ImagingUSA.org/Register, so take advantage of the early bird savings for tickets and your hotel (you can book your hotel now and will be charged later)!